I’ve just completed a fun little project combining an old fashioned telephone and twitter. When anyone sends me a public message on Twitter (@NorthernLife) the telephone rings. When I answer a text to speech chip reads out the message to me! I made this using an Arduino Duemilanove, Ethernet Shield and an Emic 2 text to speech module. This was based on Dan’s How To on Adafruit, so there was much extra coding needed, apart from controlling the telephone bell. The bell itself is rung using a toy motor, as the built in ringer requires tricky AC voltage from the phone line to work. Because of this is sounds a little odd, but it certainly gets my attention! The code needs a few tweaks to stop it ringing forever if I am away, and to stop it ringing in the middle of the night. I hope you like it, and feel free to tweet me @NorthernLife and ring my phone! 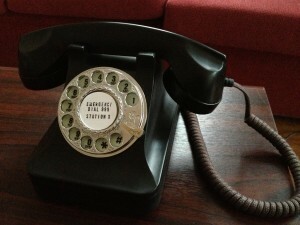 This 1940s style replica telephone is connected to Twitter! This entry was posted in Internet and New Media on 21/10/2012 by ddewhurst.